Tim Wardle engagingly recounts the fascinating story of a set of triplets who were separated at birth and reunited through coincidence when they were 19. The telling however slowly takes a darker turn as facts around the original separation are probed and frightening truths about science and human intent come to the surface. 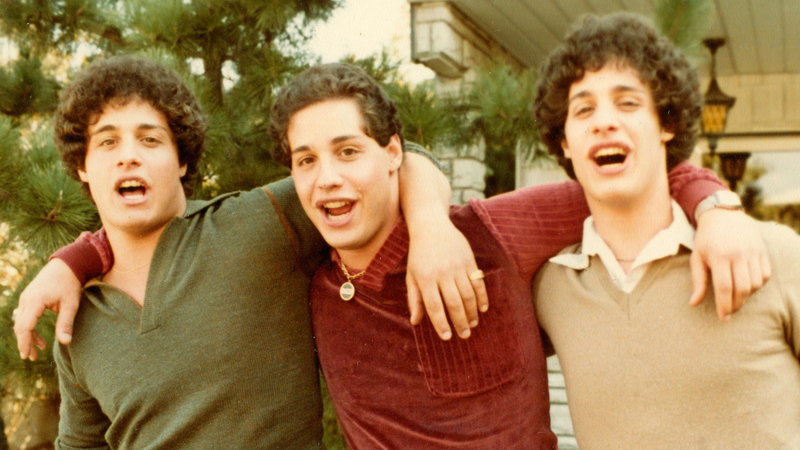 Three Identical Strangers begins by interweaving documentary and fictional storytelling modes in interesting ways. The first of the trio Bobby Shafran, now 56, excitedly narrates the bizarre incidents of his first day at college and how it ended with his discovery of and meeting with twin Eddy Galland. As Bobby’s voiceover fills in the details, the events are visually recreated and followed up with quick edits between Bobby’s image in the present, that of his friend who had also been part of the developments of that day, and their younger screen versions who are reliving that experience. The technique, which brings a nervous, frantic energy to the sequence, with the fast cuts and animated voiceovers and charged by the overwhelming nature of the story itself, builds suspense making the ultimate revelation and meeting greatly satisfying. It possibly hints, although only marginally, at how the brothers must have felt. The discovery of a third brother – David Kellman who is another principal narrator in the film – made the story even more sensational and celebratory and attracted, as the film documents, great attention from the media bringing with it a kind of celebrity. Old, yellowed photographs, shaky home video footage, interviews with friends and family, newspaper clippings, and even snippets from an episode of The Phil Donahue Show and a scene from Desperately Seeking Susan, both of which featured the triplets, are used to reconstruct a timeline to indicate how their story progressed. Their commonalities – they had all wrestled at some point in their lives, smoked the same brand of cigarettes and even had the same taste in women – indicating that they had constantly been in sync even while remaining unknown to each other made for a great story that was oft-repeated and became for a time almost a national obsession in the early 80s. The brothers enjoyed the attention, initially too thrilled by their unusual lives to wonder about why they may have been so. However, as the film chronicles a phase in their lives where subtle differences and conflicts slowly began to emerge, it also changes tonally itself. It takes a more serious path of investigation, uncovering mind-boggling truths not just about the agency from where each child had been adopted, but also about how this was not the product of chance at all but rather of a deliberate disruption of the natural order of things for the purposes of scientific experimentation and to settle questions around mental illness, heredity, free will, nature and nurture. There are two significant absences in Three Identical Strangers that become more and more pronounced as the film progresses. The viewer’s initial and growing curiosity about them ultimately culminates in revelations that are deeply distressing. The first is that of the third brother, the warm and charismatic Eddy, who is only present in the old videos and photographs, and the second of the results of a study that had effectively governed the brothers’ entire lives and set them on courses they were powerless to control or change.